Landmark Copyright Cases in China provides a comprehensive introduction to the Chinese copyright system that includes both administrative and judicial mechanisms. With China’s third major amendment of its Copyright Law now well underway, the international significance of China’s handling of copyright matters comes into a clearer focus. This book, an English translation of Chief Judge Luo Dongchuan’s recent selection and detailed analysis of twenty-five landmark copyright cases decided by the Chinese courts in the past few years, provides an in-depth understanding of the fundamental theories of copyright as interpreted in Chinese jurisprudence and of the sophisticated balance of interests among copyright owners, communicators of works and the public domain in China. Some contemporary issues, including criteria for copyright infringement, influence of new technologies and new business modes to the copyright system, are furthermore analyzed. In addition to the texts and Dr. Luo’s analyses, each case study includes comments from the judge of that particular case offering the reasoning for the decision. The judicial decisions demonstrate the latest development in judicial protection of copyright in China. 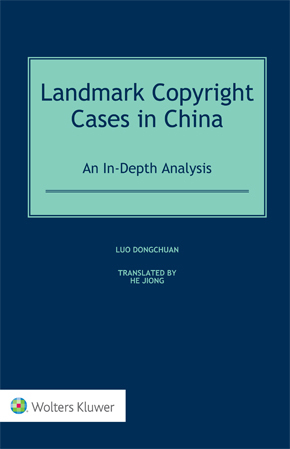 This book serves as a basic professional casebook to understand Chinese copyright law system. The value of this book to non-Chinese enterprises and individuals with Chinese connections or prospects is immeasurable. There are no peers for this book. Every professional, official, policymaker or academic interested in international copyright will welcome its prodigious first-hand communication about one of the most crucial aspects of global trade relations.